In his letter to the church in Galatia, Paul proclaims that Christ died to set us free (5:1), but he quickly follows up to tell us that we cannot use our freedom as an excuse to indulge the flesh, our sinful nature (5:13a). Rather, we should serve one another in love (5:13b). It is this type of unselfish behavior that produces spiritual fruit in our lives. Love, joy, peace, patience, kindness, goodness, faithfulness, gentleness and self-control are the fruit of the Spirit, made available to us by the cross, the ultimate unselfish act. God freely shares these character traits with believers so they will in turn manifest them to the world, drawing men and women to Himself, the Source of all good things. In this passage, Paul give us a three step approach to producing more spiritual fruit in our lives. Sometimes referred to as the law of the harvest, Paul tells us to raise spiritual fruit we must sow the right seed (vv. 7-8). Sowing to the flesh (indulging the sinful nature) reaps death, but sowing to the Spirit (yielding to the Spirit) reaps life. Do not be deceived, God cannot be mocked says Paul. We reap what we sow. We cannot “thumb our nose” at God and live a sinful life and expect His blessing. Sowing to the flesh while hoping to reap eternal life mocks God. As Paul wrote, “Those who belong to Christ Jesus have crucified the sinful nature with its passions and desires” (5:24). We must put away sinful things and “Set your minds on what is above, not on what is on the earth.” (Col. 3:2). To reap spiritual fruit we must sow the right seed. To reap a bountiful harvest of spiritual fruit we must tend the field (v. 9). A bountiful harvest depends upon healthy soil. Ask any farmer and they will tell you that sunlight, water, and fertilizer are required to increase yield. The soil must be cultivated, not too soft and too hard. It must be free of rocks, weeds and noxious plants. And, continual effort is required to keep the soil healthy. The same is true in raising spiritual fruit. We need continual exposure to the Son, we need living water flowing through us, and we need regular feeding form the Word. We must confess and repent of sin to keep the soil of our heart freshly cultivated, and we must avoid anything that would stand in the way of spiritual growth. Raising spiritual fruit requires diligently and tirelessly maintaining the field, every day, without exception. And everyone knows, it’s easier to keep the field in shape than it is to get it back into shape. Let us know grow weary in tending the field. Let us not give up before the harvest is in! Cultivate the soil and expose it to Sonlight (confess). Uproot and burn the weeds (repent). Cast out stones (forgive). Absorb the rich nutrients that come with the rains from heaven (pray). And, fertilize the soil with rich food from heaven (the Word). 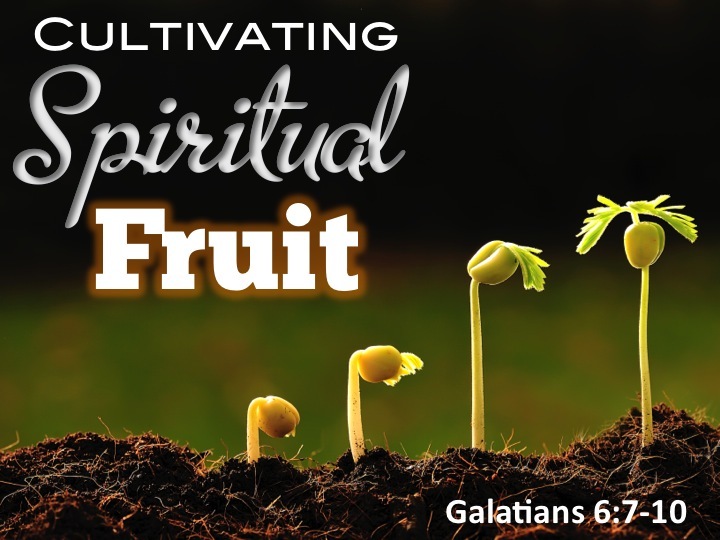 The field sown with spiritual fruit requires daily maintenance. Finally, to ensure a perpetual harvest we must share the fruit (v. 10). Doing good for all is analogous to the age old principle of multiplication by division. We multiply the fruit of the Spirit by dividing it and sharing it with others. By serving others and sharing the Good News with them we are replanting the seed. As Jesus said, “If anyone wants to be first, he must be last of all and servant of all” (Mark 9:35). Remain composed and controlled in the face of turmoil. Take a walk around the field of your life. What do you see? What condition is your field in today? What kind of crop is growing? Is your field barren or fruitful? What kind of seed have you planted, perishable or imperishable? To what are the roots anchored, are they able to withstand the prevailing winds? Are the vines running across the ground chasing after darkness, or are they stretching high into the sky basking in the glorious light of the Son? Is the soil free of weeds and rocks? Has the field been cultivated recently to expose what’s underneath to the light of the Son? Are there any signs of fruit? Some of you will be excited by what you see in the field, others will be convicted by it. If you are among the latter group, maybe it’s time to plow under the field, cultivate the soil, and replant with good Seed! Because as Jesus said, “The harvest is abundant, but the workers are few” (Matt. 9:37). To grow and reproduce spiritual fruit in our lives we must plant the right seed, tend the filed, and share the fruit. May God, who is able to do exceedingly, abundantly more than we can ask or imagine, grant to you a bountiful harvest.